Industy can help, too! Do we want to have intelligent beings working in our factories and businesses? Yes, certainly! So how can we businesses contribute toward this? First, we should put our money where our mouth is! 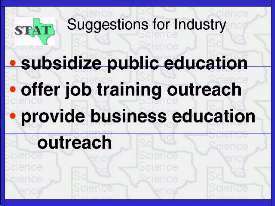 Let's subsidize public eduction throuth numerous avenues of giving. Let's provide job training for our future workers. Let's support vocational training in schools. Finally, let's show our students what business really is and how it is so essential for our culture and Country. Education outreach is a great idea, especially with the ease of communication on the Internet.